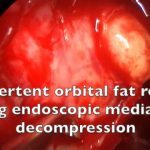 This narrated video demonstrates the down-fracture and removal of the inferomedial strut during endoscopic medial wall decompression surgery. It show this being carried out mechanically with a curette and it being thinned with a burr prior to down-fracturing. The excellent view of the strut and the relative ease of removal, as well as the option to titrate how much is removed according to the patient are strengths of the endoscopic approach to medial wall decompression. 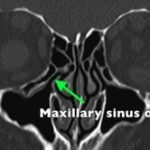 The inferomedial orbital strut or maxillo-ethmoid junction is a bony structure located in the medial orbital wall. The posterior part of the strut can be removed during medial wall and orbital floor decompression to increase the orbital volume further. 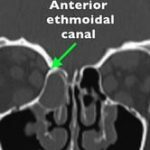 The midportion of the strut is a thickening of bone at the junction between the maxillary bone of the orbital floor and the ethmoid bone of the medial wall. 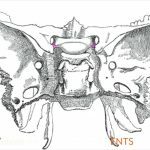 The bony support to this area of the strut is from the bulla and middle concha of the ethmoid bone, which is less robust than the support to the anterior portion of the strut. Therefore, the strut can be down fractured in this area during decompression. The posterior portion of the strut is formed by the junction of the palatine and the ethmoid bone. During endoscopic decompression less robust struts can be fractured and removed mechanically. Here the ethmoids and lamina papyracea have been removed to expose the periorbita. An angled curette is being used to down fracture the strut. Care is taken not to damage, or accidentally incise the periorbita. The strut is removed with a Blakesley forceps. Sturdier struts need to be thinned first. It is being drilled down with the diamond DCR burr (arrow). It is now thin enough to be down fractured with the curette and again removed with Blakesley forceps. Fascial attachments join the periorbita to the anterior strut, which may contribute to the support of the globe. Therefore, typically only the mid section and posterior strut are removed to minimise the risk of inferomedial displacement of the globe with consequent strabismus and diplopia.